One of the clearest pieces of evidence for the role of fire in shaping vegetation is the occurrence of alternative vegetation types maintained by different fire regimes in a given climate. The different flammability of alternative communities generates different fire feedback processes that maintain contrasted vegetation types with clear boundaries in a given environment; and fire exclusion blurs this structure. This has been well documented in tropical landscapes (e.g., ) that are often mosaics of two alternative stable states – savannas and forests – with distinct structures and functions and sharp boundaries. Currently, there is an increasing evidence that alternative fire-driven vegetation states do occur in other environments, including temperate forests ([2, 3] and figure below). 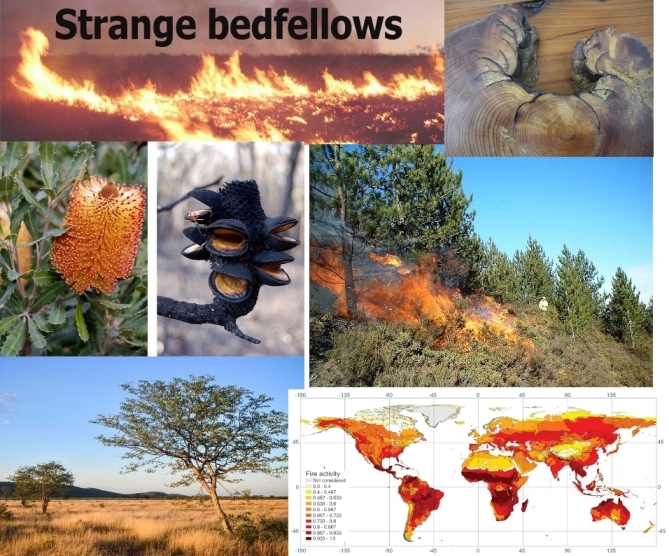 That is, the existence of alternative fire-driven vegetation states may be more frequent than previously thought, although human activities may favour one of the states and mask the original bistability. Figure: Factors determining the transition between two alternative vegetation states (fire sensitive forest and fire resilient shrubland) in a temperate landscape in Patagonia. Human factors (global warming, increased ignitions, and livestock grazing) favour transition to shrublands. From . Paritsis J., Veblen T.T. & Holz A. 2014. Positive fire feedbacks contribute to shifts from Nothofagus pumilio forests to fire-prone shrublands in Patagonia. J. Veget. Sci., 26.